One of the problems I’ve run into with my Surface RT is that the screen timeout interferes with a number of common tasks. I use my Surface to run my team’s morning standup meetings, and I have to keep touching the screen every 30 seconds to keep it active. Or, if I want to listen to music using Pandora or Google Music, the jams stop when the screen turns off. (I believe the music will continue to stream with the screen off if you’re plugged in, but I’m not usually plugged in.) I ran into a similar issue while watching a football game on Espn3.com. 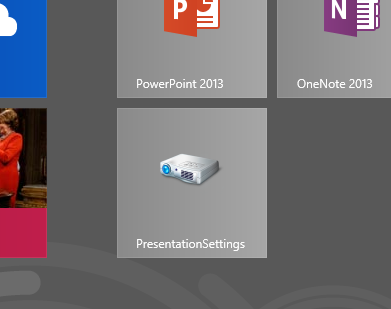 No problem–there’s an application to control your computer’s presentation settings that’s built right into Windows. It’s trickier than you’d expect to create a shortcut to it, though. 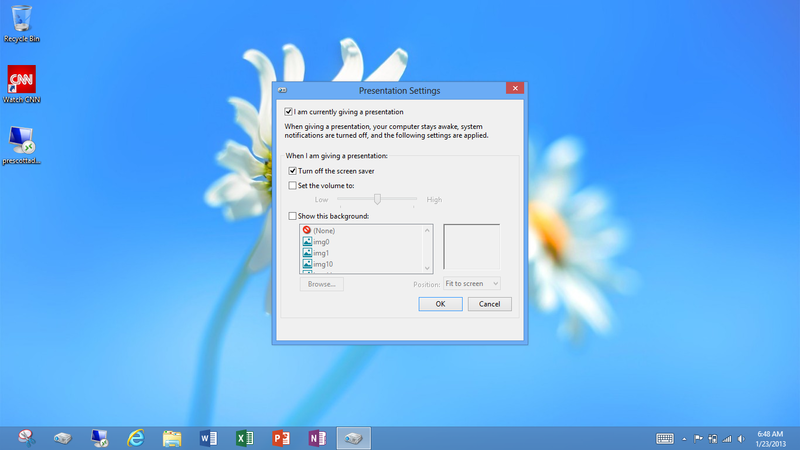 I found the setting by going to the Start screen and typing Presentation. At first, it looks like you get no results, but that’s because the default search bucket is Applications and Presentation Settings is under Settings. Checking the setting I am currently giving a presentation will disable the system timers, allowing you to keep your Surface active for an extended period of time for an actual presentation or streaming music and video from the web. I need to access this pretty frequently, so I wanted to pin it to my Start screen, but, since it’s under Settings, Windows doesn’t let you select it for pinning. Blurg. There is a way to do it, but it’s not very intuitive. 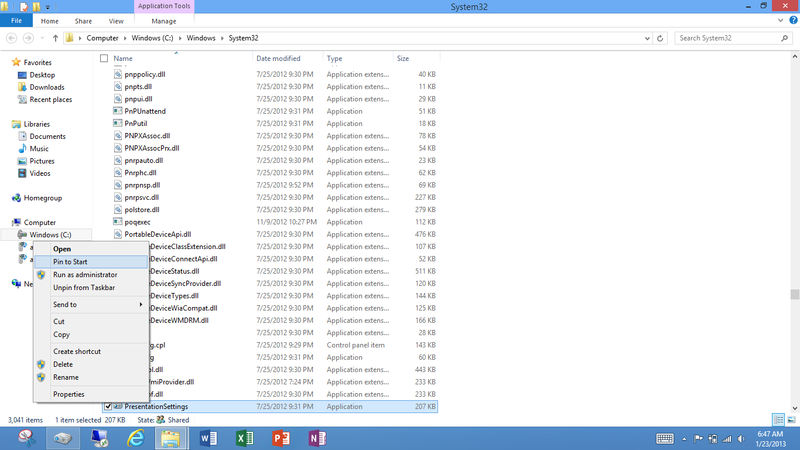 When you launch the application from Settings, it fires up in desktop mode. With the application running in desktop mode, you can right-click it in the taskbar, then right-click Microsoft Mobile PC Presentation Adaptability Client, and choose Properties. It will open a dialog where you can then click a button to open the file location. You’ll be whisked off to C:\Windows\System32, and the executable–PresentationSettings.exe–will be selected. Voila! You can right-click the file and pin it to the Start screen. The ultra-abbreviated version of this post is to simply browse to C:\Windows\System32 and right-click PresentationSettings.exe. Note that the screen will still turn off if you flip the keyboard up to cover the screen while in presentation mode, so you won’t kill your battery if you forget to re-enable the timers before closing your Surface and chucking it in your backpack. If you leave it open on a desk, you probably will, though. To maximize your battery life, you’ll definitely want to re-enable timers if you don’t need to keep the computer awake for a specific reason.